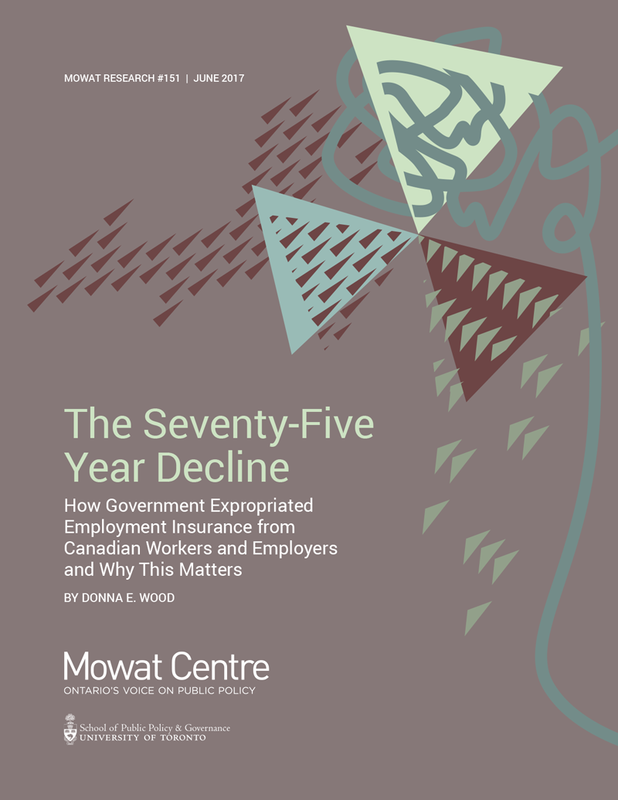 In the latest paper from the Mowat Centre, University of Victoria’s Donna Wood — one of Canada’s foremost experts on EI — argues that Canada’s employment insurance system has in effect been expropriated by the federal government at the expense of workers and employers. Wood explains that the system was originally designed to be co-managed and co-funded by employers, workers and the federal government. But a decades-long succession of government decisions have taken over the program while simultaneously ceasing to fund it. The result is that the businesses and workers that pay for the program have no meaningful say in it. Wood concludes by discussing how effective input from workers and employers can be reintroduced into Canada’s EI system. Many Canadians believe that our support system for the unemployed is broken and in dire need of reform. Almost universally, recommendations for change are addressed to the Government of Canada. This narrow focus on the federal government is surprising as, at its inception in 1940, Canada’s unemployment insurance scheme (which includes both income support benefits and the public employment service) was viewed as a tripartite responsibility of employers, workers and government. Yet over 75 years later − other than through two representatives on the four person Canada Employment Insurance Commission − there are virtually no mechanisms to facilitate oversight and secure input from business and labour, despite the fact that almost all of the costs incurred — estimated at $21.6 billion in 2016/17 — are paid for by mandatory social insurance premiums levied on their constituents. This paper looks at how — over time — federal governments of all political stripes have been able to assert control or ‘expropriate’ unemployment insurance from Canadian employers and workers by transforming and even eliminating the institutions set up to ensure business-labour-government partnerships. With only two seats on the Canada Employment Insurance Commission — compared to two for government — the EI Commissioners for Workers and Employers lack power and authority. Recent changes to consolidate EI appeals through a Social Security Tribunal have significantly diminished worker rights. All pan-Canadian advisory committees and research institutions focused on employment issues have lost their federal funding and most have closed down. This matters. Business and labour involvement in Employment Insurance is important for a number of reasons, most significantly because as a social insurance program, contributions from their members finance most of the program costs through a dedicated payroll tax. Their advice improves performance. A place at the table is also a requirement of international conventions and agreements that Canada has signed on to. If a more robust partnership and dialogue had been in place, EI eligibility benefit restrictions and a declining investment in employment services starting in the mid-1990s might have been moderated. Income inequality in Canada might not have grown to its current level. Short-term and ill-conceived decisions such as implementing a Canada Job Grant in 2013 might never have happened. Problems with the Social Security Tribunal would never have occurred. There are many reasons why business and labour oversight and input into EI has diminished over time. Certainly, the combination of Cabinet government and executive federalism creates in Canada a closed, elite dominated process involving primarily politicians and bureaucrats in any policy area. The absence of vertically integrated, highly representative encompassing ‘peak’ pan-Canadian business and labour organizations exacerbates the business-labour divide and their capacity to interact with government and with each other. The dismantling over the past 20 years of all pan-Canadian advisory committees and research institutions responsible for employment has eliminated spaces where fruitful conversations used to occur. Since assuming power in 2015 the Trudeau Liberals have focused on selected adjustments to ‘undo’ many of the changes made by the Harper Conservatives to EI. However, this is just the tip of the iceberg in terms of changes needed to modernize our programs for the unemployed. Hopefully this paper will remind Canadians of the legitimacy of business and labour’s voice in relation to our programs for the unemployed, and that the EI Commissioners for Workers and Employers will take the initiative to find new ways to ensure that their constituents are organized both vertically and horizontally to engage with governments (federal, provincial and territorial) and with each other. Putting the business-labour-government partnership on a more formal footing through a National Labour Market Partner’s Council would go a long way towards optimally re-positioning Canada’s labour market programming for the 21st century.